This is a typical diner and truck stop fair done on a hot plate. Man, I would love to have one! Such a simple and utterly delicious meal if done right. As in many recipes, timing is everything. Also, this is pretty much cooking-by-feel because there are so many variables like size of pork chops, kind of cut, heat of the stove, etc. All times given are therefore approximate. For home kitchen it is a 2 burner meal; pot for potatoes and large frying pan for everything else. Half an hour before cooking remove pork chops from fridge, place between 2 sheets of aluminum foil and pound with mallet or bottom of heavy pot to half inch thickness. Sprinkle with paprika, salt and pepper and sugar on both sides. 15 minutes before cooking chops start boiling potatoes. When potatoes start boiling preheat large heavy skillet on medium-high heat with butter and oil and start caramelizing onions. When onions are translucent, about 2 minutes, push them on side and put pork chops down in center of skillet. Do not move them for 4 minutes but stir onions on side now and then. Turn chops over and move onions on top of chops to prevent burning. Cover and cook for 4 more minutes. Remove cover and place tomato slices around pork chops on one side and move onions from pork chops on the other side. Place cheese on top of chops sprinkle with Worcestershire sauce, pour in beer, cover turn heat on high and cook till cheese is melted, about 1 – 2 minutes. While chops are cooking, mash potatoes with hot milk and butter till creamy and mix in peas. Or, just smash them, add butter and peas and mix. 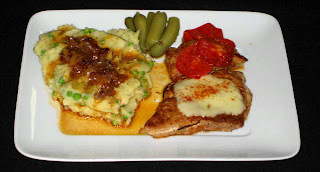 Serve pork chops on preheated plate with tomato slices on top with mashed potatoes topped with onions. Pour sauce over potatoes and onions. Garnish plate with lengthwise sliced Cornichons or garlic pickles and serve.